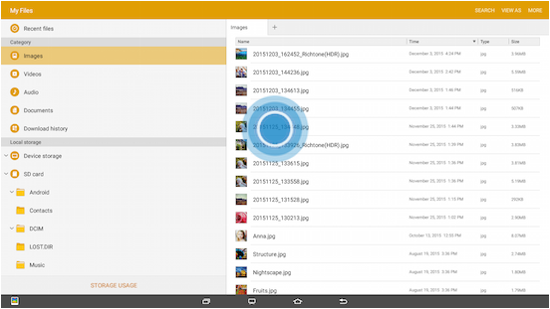 Access files stored on your device, including images, videos, songs, and sound clips. 3. Touch a category to view the relevant files or folders. For this example, touch Images . • Recent files: View recently accessed files. • Images: View image files. • Videos: View video files. • Audio: View audio files. • Documents: View document files. • Download history: View all apps and files that have been downloaded to the device. 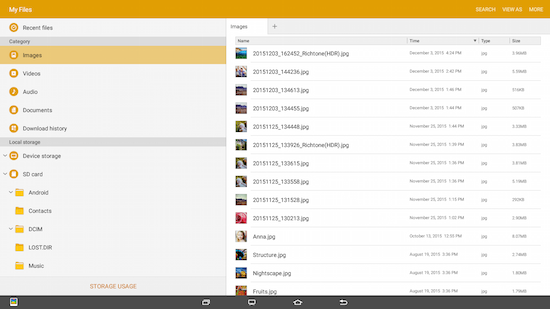 • Local storage: View folders and files in their storage locations. • Device storage: View folders and files located on the device. • SD card: View folders and files located on an optional microSD memory card (not included). • Cloud storage: Contains shortcuts to FTP servers or other cloud storage locations that you have added. • Google Drive: Sign in to view folders and files located in your Google Drive account. 4. 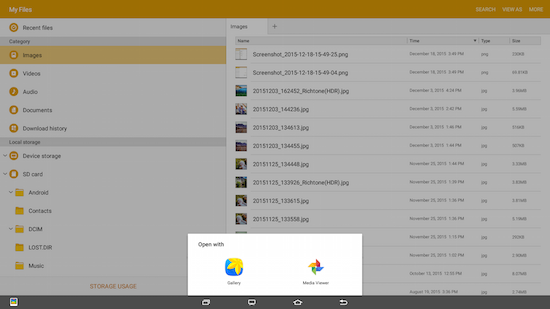 Touch a file or folder to open it. 5. If prompted, select an app to open the file type to view. • SEARCH: Search for a file or folder. • Edit: Edit files shown in Recent files. • Clear recent file history: Clear the Recent files category. • Show hidden files: Show or conceal hidden files. • STORAGE USAGE: Touch to view memory information for your device. Note: The Edit and Clear recent file history options become available only after one or more files have been accessed recently. • SEARCH: Search for a file in the selected category. 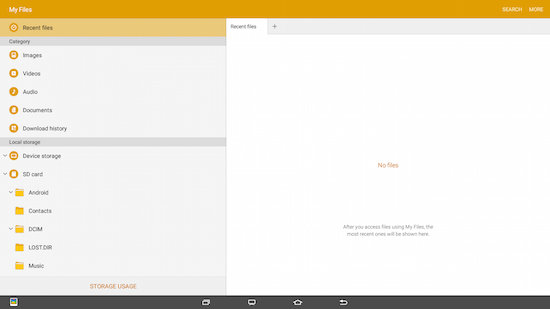 • VIEW AS: Change the appearance of the files or folders. • Edit: Select files or folders. • Share: Touch to select items to share, touch SHARE, select a sharing method, and follow the prompts. • Sort by: Change the sort order of the files. Note: Options vary by category and folder. 3. Touch MORE > Edit. • Rename: Rename a file or folder. This option only appears when just one file or folder is selected. • Add shortcut on Home screen: Add a shortcut the Home screen. • Details: View details of the selected files or folders.